So check out seven highlights below. Then tell us in the comments: What does your week’s food supply look like? How does your family measure up? 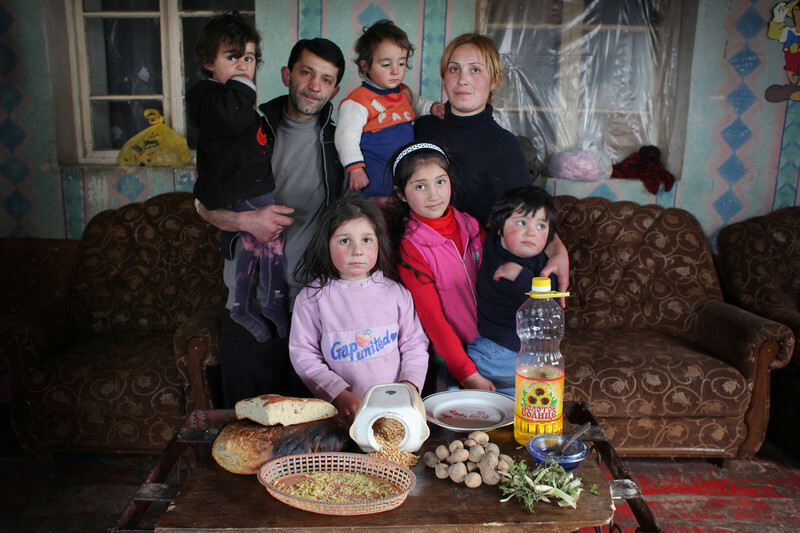 The Josephyan family from with their weekly food supply, which includes wheat flour, dried split peas, sugar, and cooking oil. The family supplements their diet with eggs laid by their chickens and wild greens from the fields. 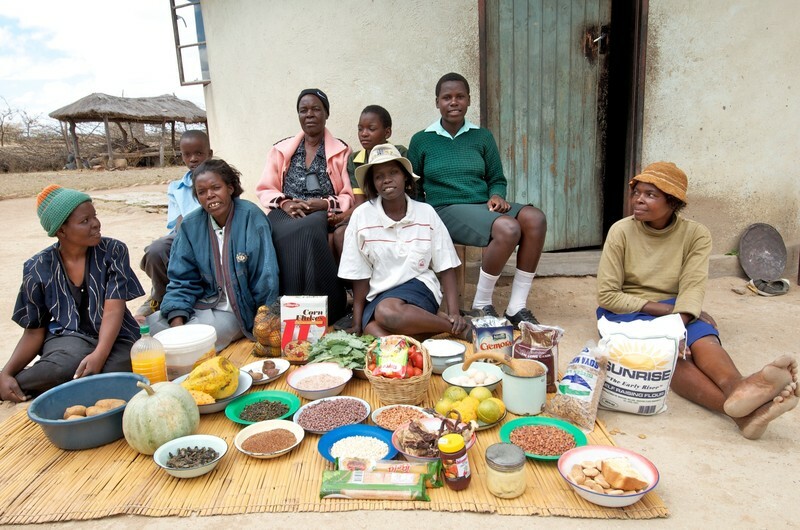 The support of people like you gives families around the world the resources they need to put food on the table and make profound changes in their communities. 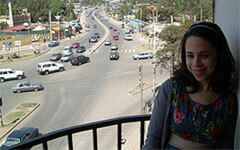 Be part of lasting change: Make a tax-deductible gift today. Read more blogs about photography. Thank you so much Anna. It helps to see rather than just hear. The varied diets are interesting; in western Africa’s Sao Tome & Principe (a tiny little island country), the local folks laugh when visitors are startled by breadfruit falling from the trees. The joke is that the land will throw food at you; bananas, mangoes, coconuts. You can’t starve, but protein deficiency is a problem. Illegal fishing has depleted the local fisheries over the last couple of decades. Troublesome. Hi Brian this sounds like Jamaica where mangoes are used to stone dogs, although we have one of the largest debt in the world and breadfruit are prized though we love and respect it. If you cannot buy rice or flour at least someone will always have a breadfruit to give. Also in Turkey where bread is wasted by almost everyone. What a SHAME! Amazing how some families seem to thrive on so little. 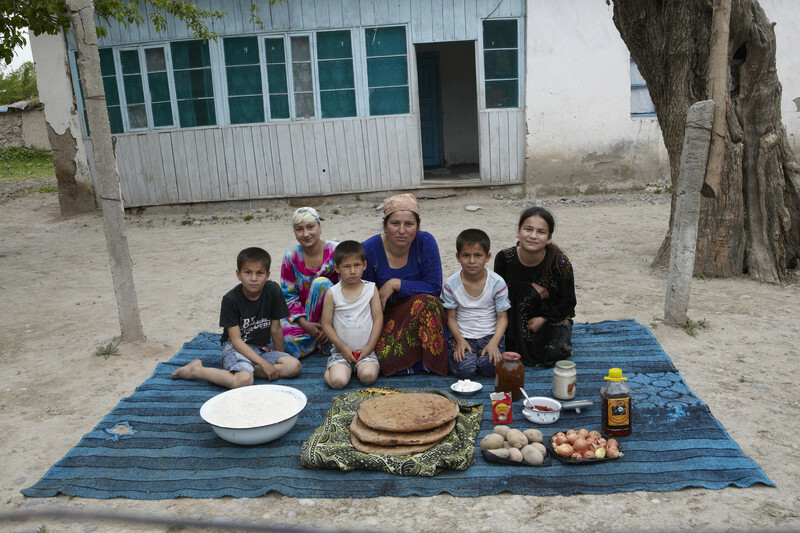 A phenomenal glimpse of family food choices around the world. How interesting, thanks for the insight. 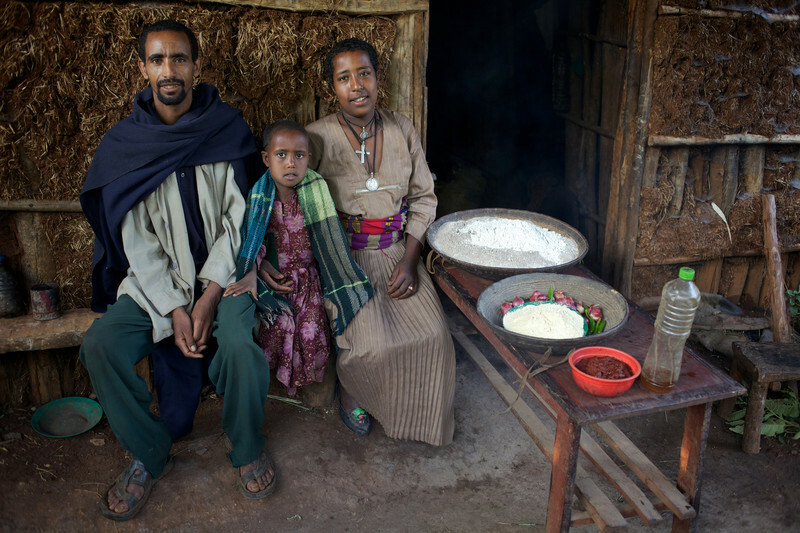 I am really amazed that we went into the hills and met the beekeepers in Mecha when I was in Ethiopia with the ONE Campaign last October, so I found myself saying to my husband, I recognise that couple! wondering which of these families live longer…..
i look and am ill knowing how much food is wasted in this country…restaurants..and in homes…and the all you can eat buttets are a sin….gorge and purge…..much food goes bad that could be saved for others but fear of a law suit keeps many going hungry unneccesarily…and all the food that gets buried in the name of profit…possibly the most disgusting…. This is a very moving and educational series of photos. We in the west need to have these photos posted in every grocery store and restaurant. thank you for this fascinating work. Thank you to everyone who read about, shared, and commented on these photos! We’re so glad to see them capturing people’s attention. I agree–they are very thought-provoking and made me think harder about my own food consumption each week. Thank you for sharing this. Many times I buy quite a lot of stuff out of impulse. It really hurts when i have to throw them away because it goes stale. This post reminds me that I need to hone my planning skills so that I can minimize the food waste. Amazing how some people can survive with awfully small portions! Just like the need for a crusade against illiteracy, there is need for a similar effort against food wastage! Thank you for these beautiful pictures! They bring us closer to our neighbors. I would like to see some western families- european and US/Canadian families (well off not poor) to show the comparison. If you have any can you email to me? Be grateful for what you have! To waste food is such as shame, especially when combined with an over health decline. Excess by itself does not equal a healthier society, focusing on nutritious, natural foods however, does. Thanks, everyone, for reading and commenting! Steve and Christine, I would love to include a photo of a more affluent family from the US or elsewhere. However, there were no photos like this taken as part of Oxfam’s photo project (though the Hungry Planet book, which I linked to in my post, does include some). If any readers would like to take a photo of their family with a week’s worth of food and are comfortable with it being added to the project, just let me know. I would be happy to feature it, either here or in a follow-up post. The London family had no fresh food. Just canned and processed garbage. So much for food banks. I will have to go back to Whole Foods to see what they do with their old food. Small shops keep a section of stuff that is over ripe or 3 day old bread type stuff. If I see stuff in my fridge about to loose it, I freeze it and use it to make soup base or fruit compote. Get creative. I volunteer at a local community garden and we get many vegetable scraps from Whole Foods to add to our compost piles. Yesterday we chopped up an immense amount of cucumbers and lettuce-most of which looked to be perfectly alright. It’s a shame that it goes to waste like that and for silly reasons (like a sell-by or use-by date that is not understood by many people), but at least here it is being used for compose to feed future crops. Thanks for this; it is very revealing. Will help me be even more conscientious about waste! Can someone please explain the concept of fresh food to the food banks in London? I’m appalled that a food bank is handing out this kind of crap and calling it food. Donations have to be storable. Donations are often made in supermarkets where people can add an item as they pass. Fresh food would be funky by the time it reached the public also, this food will last thee families a while and they don’t all have cooking facilities. I am sure there are other good reasons why. At the end of the day, for the poor and their children processed food is much better than no food. That is amazing. Thanks for the insights. Excellent post. Such a good thing to be aware of. 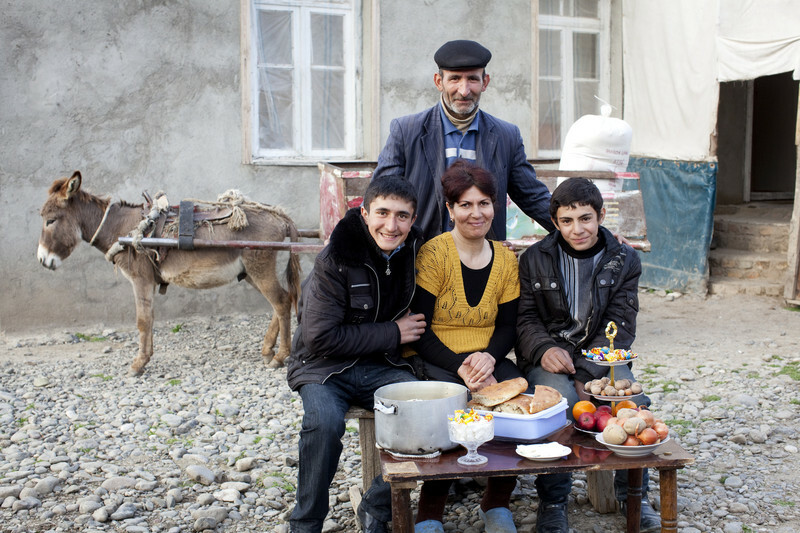 The families from Armenian and Azerbaijan take me back. I have sweet memories staying with villagers in both places and this is indeed what they eat. Simple but wholesome. 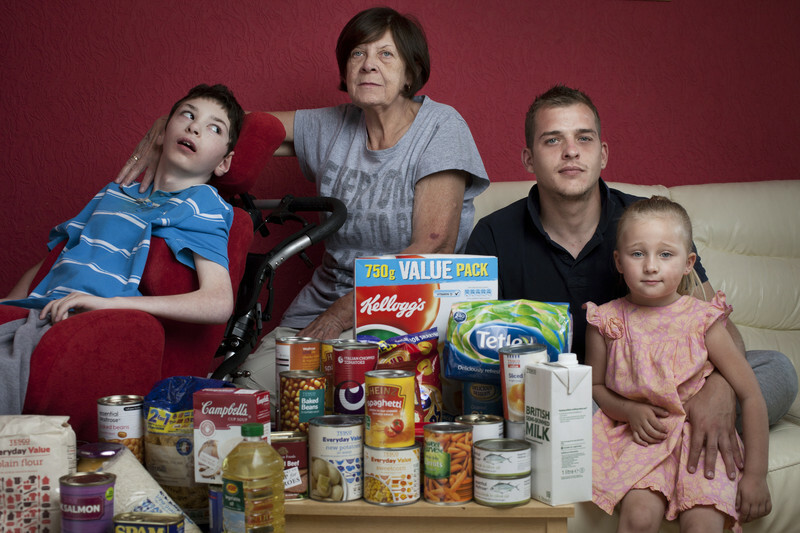 It’s striking that a family from UK is eating mostly processed food. There are no fresh vegetables or fruit, fresh meet or fish. It would be interesting to see the health records for all these families, especially to see the medical records for children. It is good to spread awareness to avoid wastages. In India more wastages of food items occurs , sorry not ‘occur’ but wasted especially marriage and other social functions of elite. A campaign is to be done to mitigate this injustice. Though food changes from place to place depending upon the weather, topography, availability, practice, need , nature of work etc. , the objective is hunger free world and healthier humanity. Let us all work in this direction. – Govindasamy Sekar, Chennai, India. Foodbanks can only give out what people like you and I give them. I have never given to a food bank. Also they don’t have the facilities to store fresh food. Interesting…no pics of American families. Probably because we would be ashamed ..and the amount of food we waste is disgusting. We have so much , its insane. I noticed that the difference from their food and the food that I buy seem to show that although they don’t have an over abundance; they seem to have a way better diet . I see fresh fruits, fresh veggies, some have nuts, and fresh milk. I hardly ever buy fruits or fresh veggies,(too expensive for my budget), I buy milk but don’t drink much because it’s not fresh, I do have beans and tortillas, but I don’t buy bread; so it goes to show we might live in America but that doesn’t mean that we have it good, I would love to eat fresh fruit and veggies, but just can’t seem to budget it in so I do without. 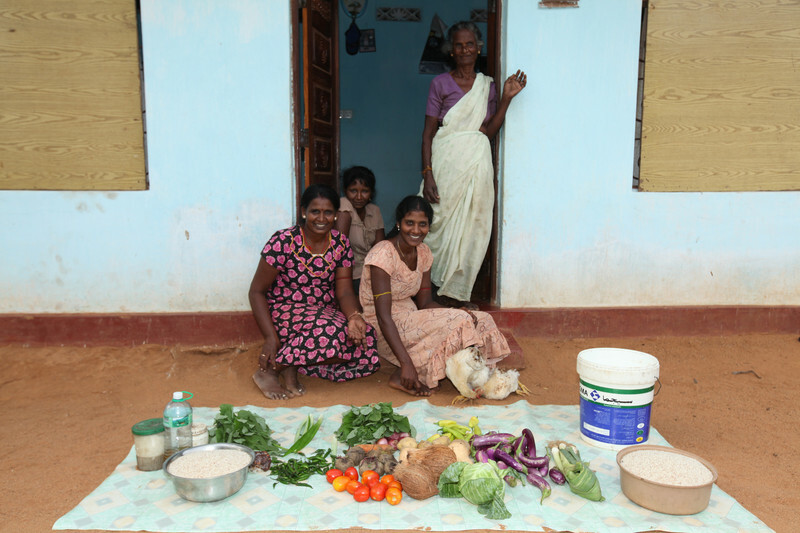 The family with the most fresh produce (the Sri Lankan family) looks the healthiest and happiest by far. As “Priss” mentions, in the USA our fruits and vegetables can be expensive, especially the organic produce. I am on a limited budget but make it work by shopping at the less expensive farmers’ markets, buying produce in season, buying dried goods in the bulk section, buying non-perishables on sale or online, and almost never buying prepared foods or foods without nutritional value. I make my own sauerkraut, almond milk and yogurt, and grow sprouts. As a renter, I can only have a container garden, but am able to grow a small amount of strawberries, lettuces, beets, potatoes, herbs, and tomatoes. In addition to the fruits and veggies from the farmers’ markets, my grocery list includes lentils, split peas, brown rice, quinoa, rolled oats, nuts, edamame, tofu, tempeh, olive oil, coconut oil, coconut milk, curry paste, and fair trade tea and coffee. If I’m on my last couple dollars, I’ll dress up a 20-cent ramen soup package by adding broccoli, wakame, edamame, and green onion to the simmering broth. I’m learning about bee-keeping so when I have enough money saved up for supplies, we can have our own honey and trade some for eggs. I guess my point is, it might take extra work, restraint, and creativity, but a healthful diet can be maintained on a very low paycheck. Beans and tortillas aren’t terrible, but they are not enough. You need the vitamins and minerals found in fresh fruits and vegetables!